What is causing voltage dips? Figure 1 shows the profile of a voltage dip, together with the associated definitions. The major cause of voltage dips on a supply system is a fault on the system, that is sufficiently remote electrically that a voltage interruption does not occur. Other sources are the starting of large loads (especially common in industrial systems), and, occasionally, the supply of large inductive loads. Voltage dips due to the latter are usually due to poor design of the network feeding the consumer. A voltage dip is the most common supply disturbance causing interruption of production in an industrial plant. Faults on a supply network will always occur, and in industrial systems, it is often practice to specify equipment to ride-through voltage dips of up to 0.2s. The most common exception is contactors, which may well drop out if the voltage dips below 80% of rated voltage for more than 50-100ms. Motor protection relays that have an undervoltage element setting that is too sensitive is another cause. Since contactors are commonly used in circuits supplying motors, the impact of voltage dips on motor drives, and hence the process concerned, requires consideration. Other network-related fault causes are weather–related (such as snow, ice, wind, salt spray, dust) causing insulator flashover, collisions due to birds, and excavations damaging cables. 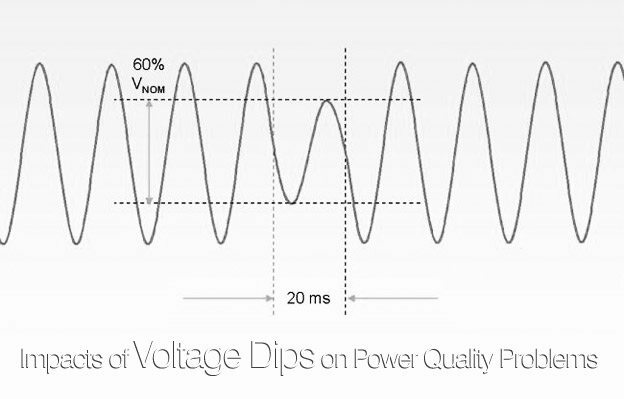 Multiple voltage dips, as illustrated in Figure 2, cause more problems for equipment than a single isolated dip. The impact on consumers may range from the annoying (non-periodic light flicker) to the serious (tripping of sensitive loads and stalling of motors). Where repeated dips occur over a period of several hours, the repeated shutdowns of equipment can give rise to serious production problems. Figure 3 shows an actual voltage dip, as captured by a Power Quality recorder. Typical data for undervoltage disturbances on power systems during evolving faults are shown in Figure 4. Disturbances that lie in the front right-hand portion of the histogram are the ones that cause most problems, but fortunately these are quite rare. How do avoid voltage dip in industry,because of most sensitive equipment was tripped while voltage dip. please reply me.